Going on from my Crochet Clothing post it seems I’ve accidently joined in with another crochet trend in making this jumper for my sister’s birthday – Crochet Ombré. She’s a big fan of the colour yellow. She quite likes the muted tones but she REALLY likes the bright, bold, hit you in the face kinda yellows! I swear my nephew should be wearing sunglasses every time he goes into his bedroom! 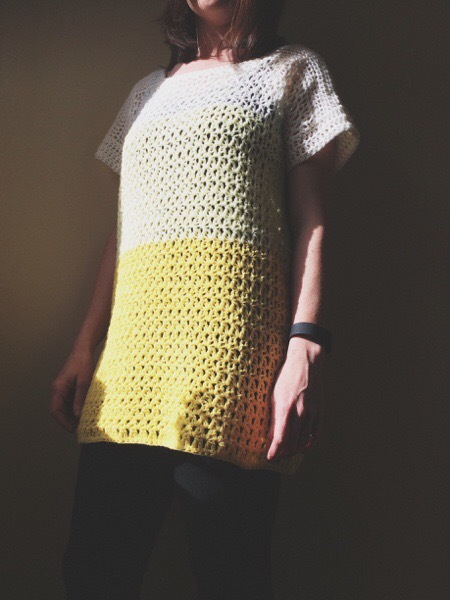 After she expressed a liking to my green jumper it seemed logical to make a yellow one for her for her birthday. 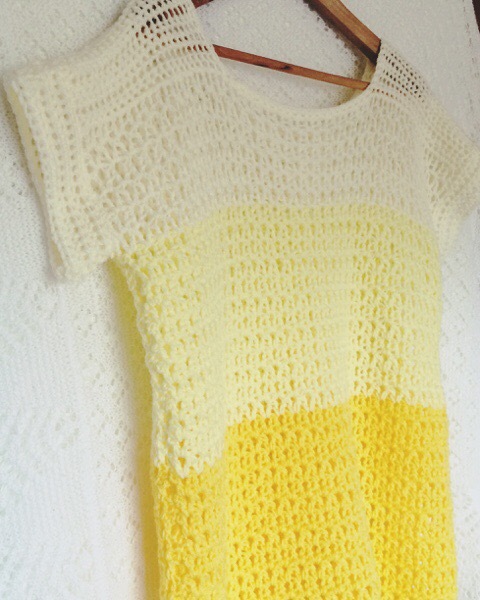 I couldn’t bring myself to make the whole jumper in the brightest yellow that I knew she’d love though. I started out with that intention but I’m a bit more colour resevered and some kind of psychological barrier prevented me from doing it. So, I went for an Ombré approach instead – and this gave me the perfect excuse to set up a new pinterest board! I made this jumper using the same pattern as my green jumper but as I’m still experimenting with the pattern I made it longer, with a bigger hook and a looser tension. There’s that impatient crocheter coming out again! The finished result came out lovely and snuggly – perfect for chilling out in leggings and big fluffy socks. And, I think the ombré pattern works really well. I used a bright yellow, a more muted tone and then a cream. I’m really pleased with the finished result and this won’t be the last ombré item I make – I like this trend! It might help me to make bolder colour choices. 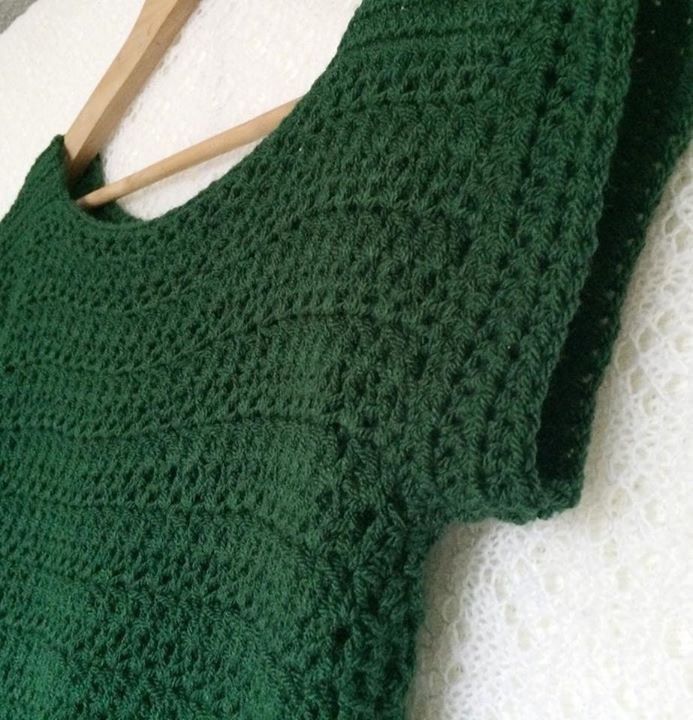 Keep an eye out for the jumper pattern – it’s coming soon! 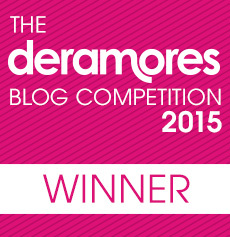 This post is my submission to the Deramores Craft Blog Competition 2015. Deramores is the UK’s number one online retailer of knitting and crochet supplies. Visit http://www.deramores.com for more details. Thanks Kate – am starting to wish I’d kept it and sent my sister a gift card instead! 😂 I’m not usually keen on yellow but the Ombre effect has definitely changed my mind. Any idea how much yarn was used for this? I can’t remember but I think it was probably 1 X 100g of the two lighter colours and 2 X 100g of the darker yellow. Sorry if I’ve got that wrong. This is beautiful,!! I’m in process of crocheting for my 9 grandkids, mostly hats, scarves and purses for my 5 girls. Everyone always says I put myself last. 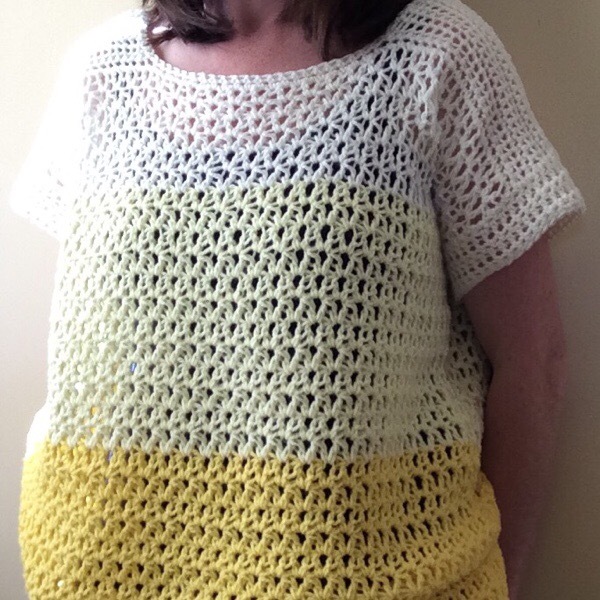 But I’ve been wanting to try crocheting clothing and your blouse may just be what puts grannybee in 1st place! 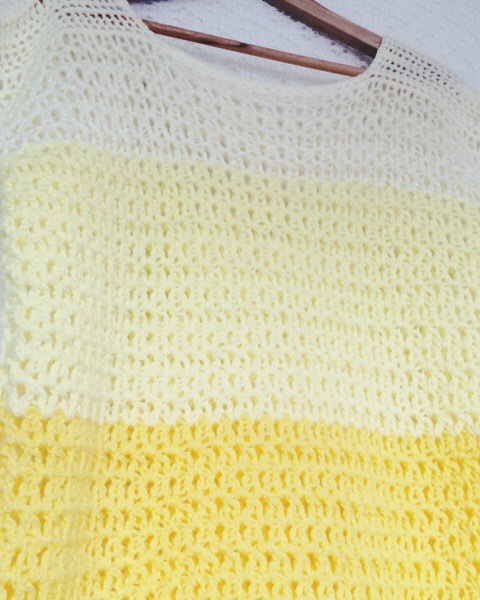 : -) I love the yellows and have the colors to make. But my fave color is blue, all shades and I cant wait to get started! I’ll post when it’s done and definitely give you credit for your friendly and generous spirit. Ty so much for sharing. This is lovely!!! I crochet a lot for my 9 granz. Eveyone says I always do for granz and not myself. But I think this is just the motivation to make something for Grandma Bee! 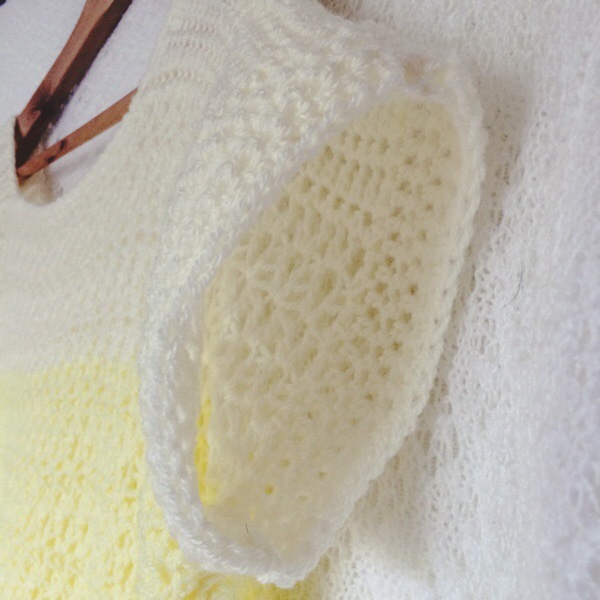 I’ve been wanting to try crocheting clothing n have did one baby dress. I love your patterns and they’re easy to adopt for my size! 🙂 Will definitely post when its done and with a link back to you. Ty for your friendly and generous spirit.